Start off from the Avenida de Sa Pau (main road of the town) and go north to the main roundabout that gives access to the different developments along the southern coast. At Plaça de sa Pau square take the 3rd exit towards the Alcaufar road/ Me-8. Go straight on until you reach a small island. Then veer right towards the Biniancolla road. This road has a narrow carriageway and very uneven surface and is very busy in summer, so you should respect the speed limits indicated for each section, as well as keeping a special lookout for mopeds and cyclists along the way. 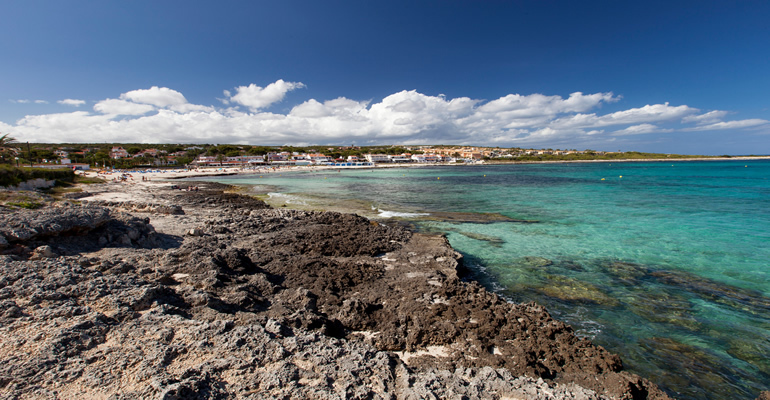 Approximately 1.2 km further on you’ll see a junction with reduced visibility with a sign for Punta Prima. Stop the vehicle then turn to the left into the Punta Prima road. Go straight on for approximately 1.4m until you reach a roundabout. At the roundabout, take the 2nd exit into Carrer Costa de Sa Platja. Continue along this road to Passeig de s’Arenal. Then turn right and continue along the Passeig until a few metres away, you see a large public parking site (free) where you can park. Punta Prima beach, flanked by low rocky areas crowned by residential dwellings that extend right down to the beach, is medium-sized (200 m long by 75 m wide), a sea bottom with deep sand and some areas of algae and undersea plants to the side and a very gentle slope, is very popular with local bathers and tourists. From the shore you can see the Illa de l’Aire island. The development also has numerous tourism centres, restaurants, supermarkets and souvenir shops.